Say whaaat!? I am SO EXCITED ABOUT THIS RECIPE!!! Remember when I blathered on about blogging and editorial calendars yadda yadda yadda? Yeah, here I am throwing all that malarkey out the window. I mean, I’m still all googley-eyes for my editorial calendar, BUT: I couldn’t wait THREE FREAKING WEEKS to post these photogenic beauties of a cookie. LOOK AT THEM: THEY ARE SO PRETTY!? I’m playing favorites here. These are my new favorite cookie babies! I grew them — I mean, I MADE them myself!! Someone is feeling silly today… sorry/not sorry. The candied lemon comes in here for one simple reason: I found some in the garage. Yeah, I know what you’re thinking: “Didn’t your mother ever tell you not eat candy you find in random places?” Um, yeah I’m sure she did. But this wasn’t random. It was DESTINY. That candied lemon — unopened, beautiful, yellow, sweet, cuddly — was calling. my. name. Who am I to ignore the call of a lonely lemon? I’m on it. I ground up the (already small) candied lemon with the sugar — it didn’t get that small, but it made the sugar extra-fine and helped distribute that lemon flavor a bit. Food processor = WINNING. As usual. Toast the coconut in a pan on the stove — it’s quick and easy, just don’t ignore it and burn it. 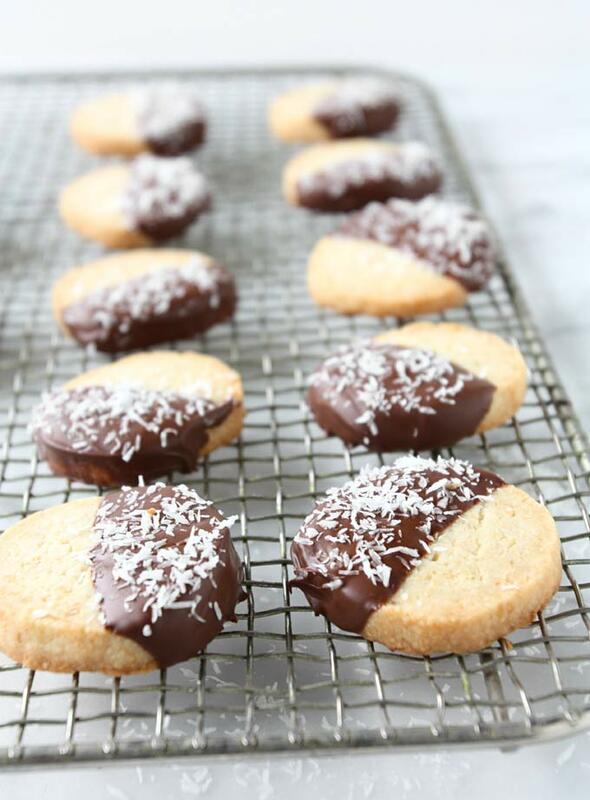 Nobody wants a burnt coconut cookie. Or doooo they? Newest trend? Can I call it right now? 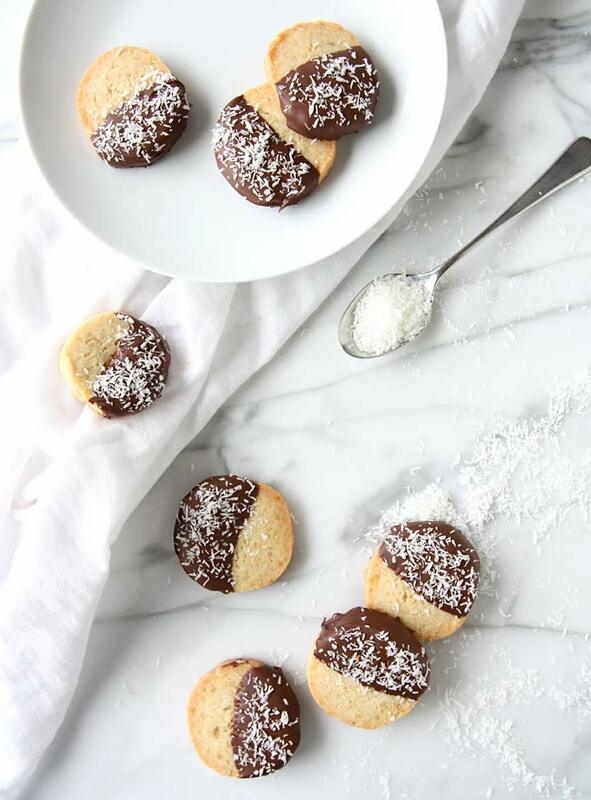 Burnt coconut cookies? Any takers? Fine. I’ll keep my coconut un-burnt (burned? I’m always confused. Sorry guys.). MIX UP THIS DOUGH! PUT IT IN THE FRIDGE! SLICE ‘EM UP! BAKE BAKE BAKE. Then, my favorite part: DIP IN CHOCOLATE. Oh heck yes. 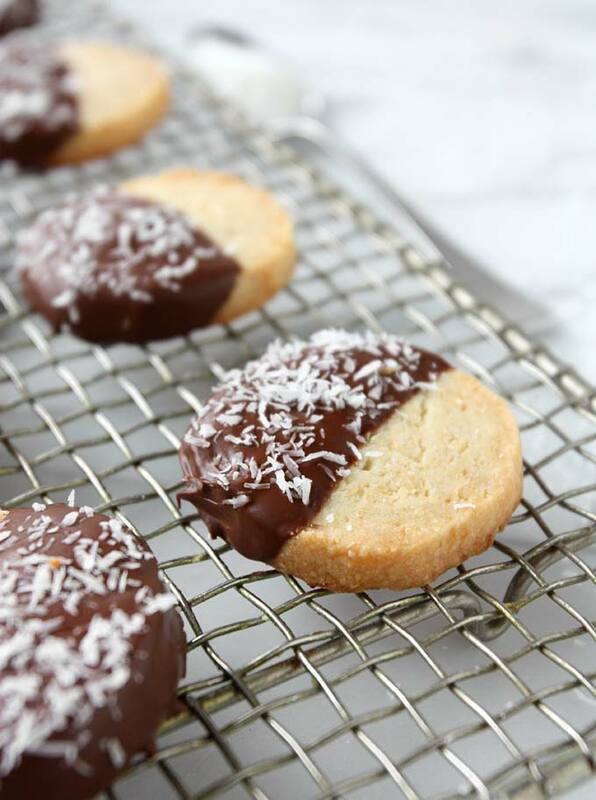 Then you can sprinkle some extra coconut on top! I didn’t toast that coconut, but I sure as heck could have. And you sure as heck can, too! I won’t stop you! Then line these babies up for some photos because they’re seriously beautiful (maybe you can make yours more round than mine…) and try not to inhale them in one sitting. Just try. xoxo! In a frying pan over medium heat, cook the shredded coconut. Stir almost constantly with a spatula until it is golden-brown. Set aside. In a food processor combine the sugar, candied lemon, and salt. Pulse for about 30 seconds, or until the sugar is quite fine and the lemon is in very small pieces. With a mixer, cream the butter together with the sugar-lemon mixture until creamy and light. 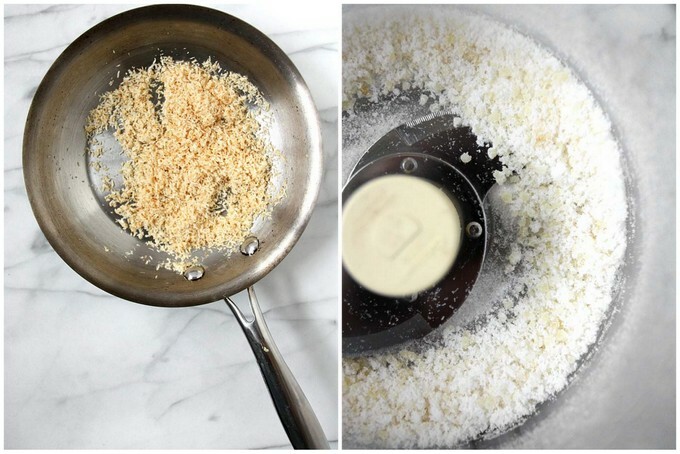 Mix the coconut in with the flour before adding it to the butter. Mix until crumbly, then use your hands to bring it together. On 2 sheets of wax paper or plastic wrap, form the dough into two (separate) logs of dough about 2″ in diameter. Roll, twist the ends to seal, and refrigerate for 30 minutes. Preheat the oven to 350, slice the dough 1/4″ thick, and cook for 15 minutes. The bottoms of the cookies should just be turning golden, but the tops shouldn’t (do as I say, not as I did!). 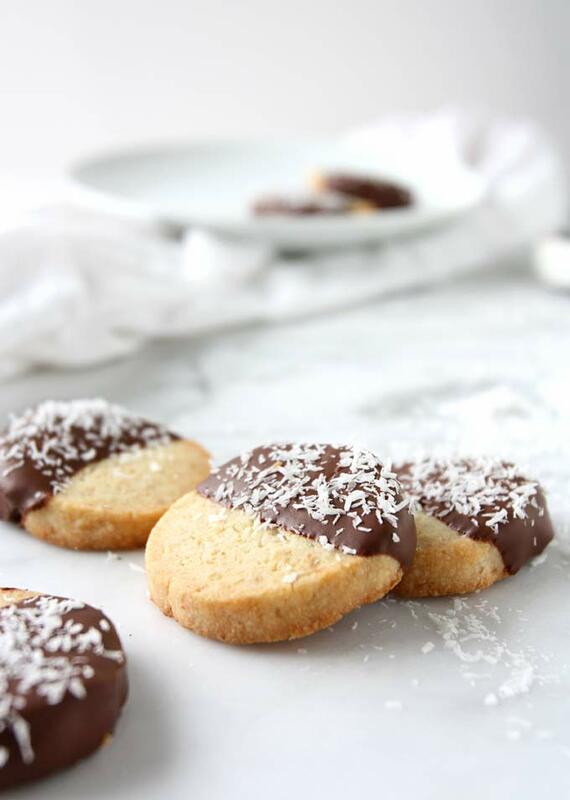 When the cookies are done and cooled, melt the chocolate over boiling water (or in 10-second increments in the microwave), stirring until smooth. 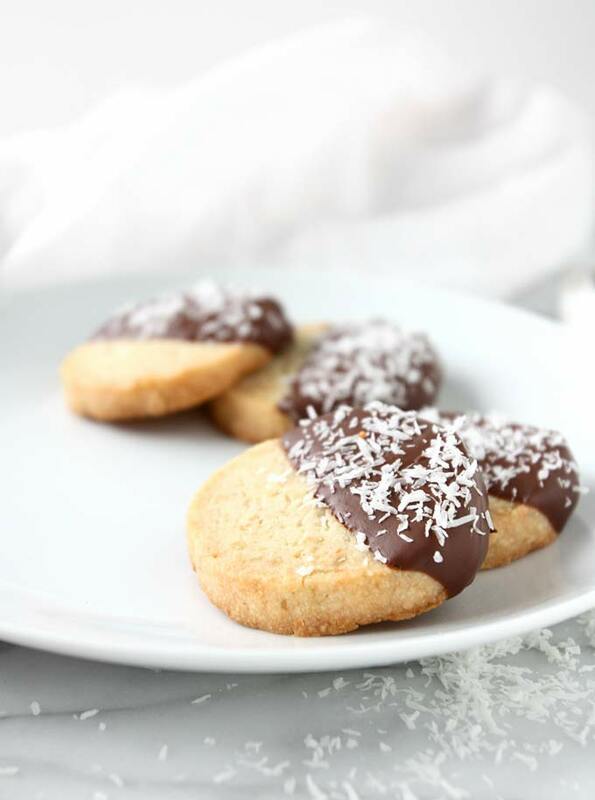 Dip half of each cookie into the chocolate, wiping away excess from the bottom, and immediately sprinkle extra coconut on the chocolate. Let the chocolate harden for an hour before packaging. 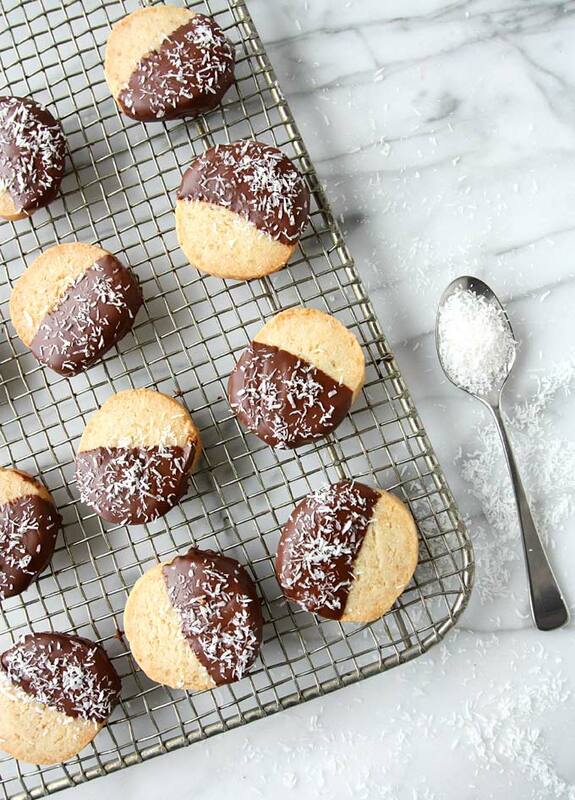 These cookies look to die for.